You might be thinking, “But Creighton, that’s just madness. Your fingers won’t be able to take the strain!” Have no fear, my fingers are made of stern stuff and I’ve been training them for years. They’ll struggle through. As you might recall, last September I attempted to write 1,000 design words a day. While I succeeded and hit my 30,000-design word target, I afterwards concluded 1,000 words a day is doable but skates on the very edge of achievable when stacked up with all my other Raging Swan Press related jobs (not to mention my family life). In the long term, for me, 1,000 words a day is not doable. That said, I’m the kind of chap who thrives on targets and goals. So I’ve decided to shoot for a yearly target of 131,000 design words. That might sound like a large target, and quite arbitrary, but it really isn’t. I’ve recently become intrigued by the power of “little, but often.” Writing a 30,000-word adventure can seem overwhelming to anyone. Writing the introduction, followed by a section on adventure hooks and so on, though, is much more approachable and far less intimidating. In my experience, dividing a large target into smaller parcels of work makes the entire process much more approachable. Just before the New Year, I worked out that 2019 has 262 work days (i.e. days that are not Saturday or Sunday). If I write 500 design words a day, I’ll hit my 131,000-word target. I’m sure that some days I’ll be ahead, and some days I’ll be behind but as long as I average 500 daily design words I will be victorious. Five hundred words seem to take me about 30 – 45 minutes and calving out half an hour a day to write shouldn’t be too hard. Of course, occasionally I’ll cheat. For example, if I am writing an adventure and need a skeleton’s stat block, and I already have one, I’m not going to type it all out again. Instead, I’ll call forth the sinister power of copy and paste. To do otherwise would be madness! Think what I could achieve with 131,000 words! A Village Backdrop from Raging Swan Press includes about 4,800 design words (and around another 1,800 of boilerplate words—the OGL, table of contents and so on). A 20 Things article comes in somewhere around 800 design words. Forgotten Sepulchre of the Father’s final draft was about 7,000 design words. 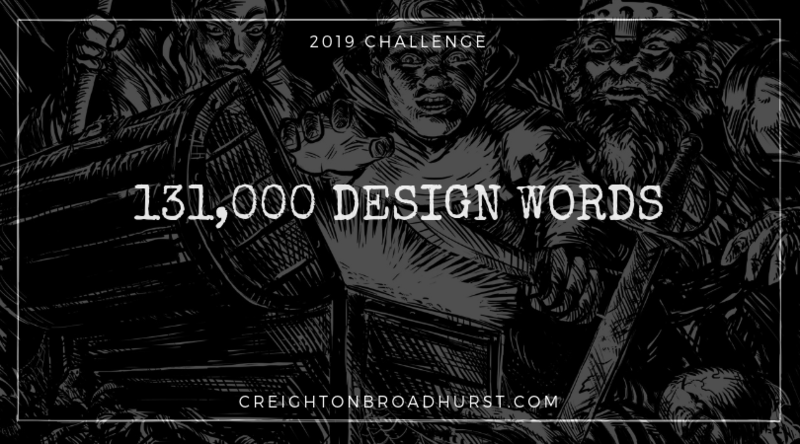 Forsaken Demesne of the Demon’s Cultists first draft was around 30,100 design words. So much writing fun awaits! I’ll be keeping you up to date on a monthly basis. This will keep me accountable and motivated. In upcoming months, I’ll be posting up a running total of what I’ve written and I might even include a graph! Is the doable? Am I mad? Have you done a similar challenge? Got a suggestion for something I should write? Let me know, in the comments below. Sounds pretty epic in scale, I look forward to seeing your progress 🙂 Add unnecessary colours and graphics to the graph and I am all in! I think I can promise you some unnecessary colours on the graph. What kind of graph would it be otherwise! Excellent resolution! And you’re not alone – I’m going for 300 a day in 2019! May inspiration strike us both daily! Good luck, Bart! I hope you hit your target! This is rather inspiring. I might have to do my own challenge as well. Maybe I’ll start easy with 100 words per day as this is the first time im trying this. Go for it, Matthew. You’ll be surprised how much you get done. Good luck! Great idea! I “won” NaNoWriMo back in 2010 – that’s a mad dash of 1,667 or so words a day. I like the 500-word-workday idea better. I *might* even be able to pull it off myself! Looking forward to seeing what great new things you accomplish along the way. You asked for ideas on what to write about, and have you considered branching into the Call of Cthulhu game… or maybe just Horror themed? I play and write both D&D and CoC scenarios, and your lists and inspiration are great tools for me as a GM, and I sometimes try to fit in some of your work into a CoC scenario, but was hoping that maybe one day you would do something that was designed for use in a Horror game? I would love to write some more horror stuff. I’m a huge Lovecraft fan! Is there a CoC license? I’m not wise in the ways of CoC legal stuff.